Wooden instruments should be oiled regularly every couple of months to help protect the wood from temperature and humidity changes, and the moisture that they are subjected to during playing. 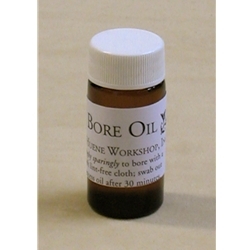 Apply bore oil sparingly to the bore of the instrument using a clean lint-free cloth wrapped around a cleaning stick. Let it sit for an hour or so, and then wipe out the excess. Care should be taken not to get any oil on the block of the recorder, the cork of a flute, or on the pads of any keywork, and that oil does not build up in the tone holes. One bottle contains .25 fl oz, or enough for several oilings.